Chapel Hill is a particularly beautiful (population just over 52,000) college town in the gentle hills of central North Carolina. The University of North Carolina (24,000 students) is the centerpiece of this charming small town with a cosmopolitan flair that makes it appealing to a wide variety of people. This entire area is highly educated, with Duke University nearby in Durham and NC State just 30 miles away in Raleigh. The three towns are sometimes referred to as the Research Triangle in reference to the research park, Research Triangle Park, formed in 1959. The area has grown so explosively that surrounding towns like Carrboro and Durham have in effect merged into Chapel Hill. The university and the downtown are intertwined to create a classic college town atmosphere. The downtown is widely used by students and residents for dining out (it is famous for pop-American cuisine), entertainment, coffee bars, and artistic performances. Housing choices are extremely varied. Its residential neighborhoods have a range of architectural styles that complement the university’s Georgian style. There is every type of retirement community nearby including golf communities, mixed generation villages, and assisted living facilities (See Active Adult Communities link at top right). Condos and apartments are also available. The median price of homes in Chapel Hill is higher than elsewhere in North Carolina and nationally. Prices will vary dramatically depending on how far you get from the center of town (farther away the cheaper) and what type of housing you want (planned communities will generally be more expensive per square foot). The NAR reported the average selling price in the Durham-Chapel Hill area was $282,200 n the 3rd quarter of 2018, while it reported the median in Raleigh to be $287,800 in the same period. Traffic and overdevelopment can be a problem. Real estate prices in Chapel Hill proper are quite expensive, almost double the national average. Chapel Hill is located in rolling hills in central North Carolina. It is 3 hours from the Blue Ridge Mountains as well as the Atlantic Coast. Summers are hot and winters milder than in the northeast. Chapel Hill was Named America's "Foodiest Small Towns by Bon Appetit. Nearby Raleigh offers museums, art shows, symphony orchestra concerts, and many performing arts events. The local music scene is very active, some of takes place in the many bars and clubs. Performing arts opportunities are provided by the universities in the area, mainly UNC and Duke. There are some festivals throughout the year. The crime rate in Chapel Hill is below average. UNC Hospital is one of the top teaching hospitals in the world with more than 750 physicians. 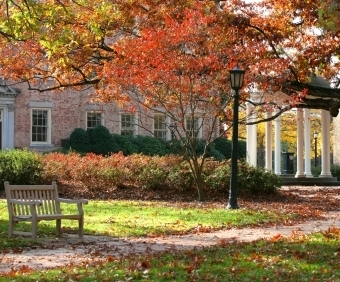 Duke University hospital and others are available in nearby Durham. Raleigh Durham International Airport is a convenient hub just 19 miles away. Chapel Hill Transit offers daily bus service. Amtrak offers service in Durham (11 miles).